Heat a skillet to medium high. Place the Beyond Burgers on the skillet and cook for 3 minutes. Flip the Beyond Burgers and add the cheddar slices. Cover the skillet and cook for an additional 2 1/2 minutes. 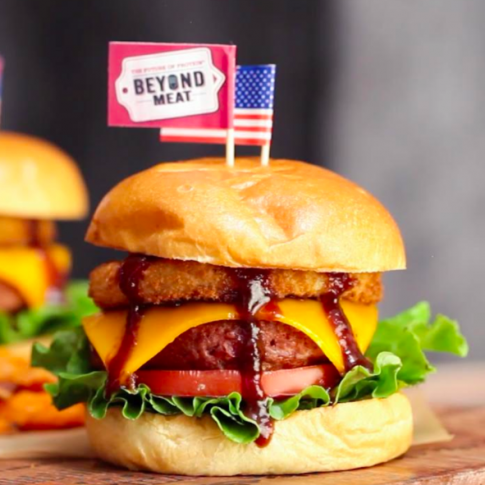 Uncover the skillet and add the hamburger buns next to the Beyond Burger patties. Toast the buns for 30 seconds. Layer a large lettuce leaf and tomato slice on the bottom of the bun. Top with the cheddar covered Beyond Burger. Finish each burger with 2 onions rings and a healthy drizzle of your favorite BBQ sauce. Enjoy!